John Boyne’s book The Boy In The Striped Pyjamas made such a compelling film that, I have to admit, I choked back the tears (I’m that sort of gal) – but would a theatre version have the same emotional impact? The acclaimed Children’s Touring Partnership has established an enviable reputation producing superb family drama like Goodnight Mr Tom & Swallows And Amazons. So it’s a match made in heaven for the company to partner the equally prestigious Chichester Festival Theatre to bring this World War Two drama alive on stage. It had its world premiere in Chichester last week and now the production is on a national tour. The first stop was Northampton’s Royal & Derngate Theatre where it opened tonight. The story, and, indeed the performances by the central characters, two nine-year-old boys, leave a lasting impression. 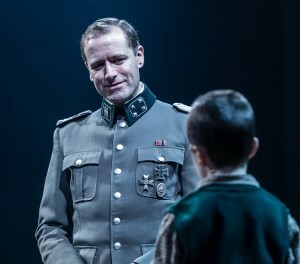 A total of six lads are sharing the key roles of Bruno and Shmuel and tonight we had a confident turn by Cameron Duncan as the commandant’s son and Sam Peterson as the young Jewish concentration camp prisoner. Cameron gives a commanding performance. It’s a huge responsibility for him. A mountain of dialogue to learn and the weight of the entire play on his slight shoulders. But he demonstrates a firm handling of the subject and has bags of personality. Sam was less sure of himself, but that’s ok and in keeping with his role of a starving waif trying to survive in a Polish camp mispronounced throughout, by the children, as Out-With. The story of lost innocence is set in 1943. Bruno’s family is being forced to move out of Berlin because his father has a new job. Mother (Marianne Oldham) tries to make light of it. It’s duty, they have to go, she says. But even she doesn’t relish being torn from civilisation. Later we learn that Father (a quite chilling Phil Cheadle) is in charge of a concentration camp where he must put into effect the Final Solution. Bruno and his older sister Gretel (Eleanor Thorn) are forced to stay inside their home but, in a beautifully choreographed break-out scene, the boy escapes to explore and discover who the mysterious people are he could see living behind a barbed wire fence. At the perimeter he makes friends with a little boy, Shmuel and it is a friendship with tragic consequences. Angus Jackson has come up with a working adaptation of the book which brings the show in at under two hours (including interval) but there has been, understandably, considerably editing of the story. There are moments when the play feels a little rushed with characters not given room to develop or even fleshed out. I wanted to see more of Robert Styles’ beautifully observed performance as Pavel, a Jewish doctor turned cook; Kotler, the handsome, muscle-bound young officer played by Ed Brody and even the German family’s cabaret-singing gran (Helen Anderson). Instead the story is pared right down to the boys’ perspective and they do an admirable job. Should you let your children see it? Absolutely although CTP is recommending it only to the over 11s. The powerfully told drama sends a shiver down your spine – particularly the last scene. 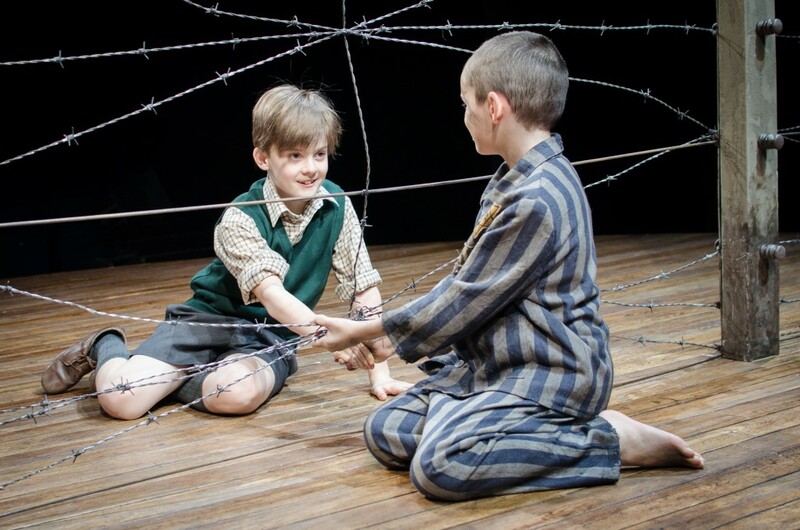 The Boy In The Striped Pyjamas runs on the Royal stage until Saturday.